In a small, stylish space with bamboo window shades, chef-owner Young Cho Kim churns out an inventive assortment of sushi, nigiri and sashimi along with select Japanese and Korean specialties at Cary's Oiso Sushi and Korean. 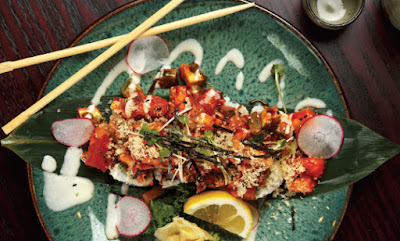 The namesake specialty sushi roll melds spicy lobster and deep-fried lobster with asparagus. It’s crowned with tuna, salmon, tobiko caviar, eel sauce, wasabi mayo and spicy mayo. The Hurricane roll consists of tempura shrimp, lobster and avocado encased in crispy, shredded potatoes. Spicy sashimi don with avacado (pictured below) is first-rate. Chef Kim’s sushi roll involves tuna, salmon, lobster salad, chives, cilantro and masago caviar in daikon wrap topped with citrus-tinged ponzu sauce, truffle oil and seaweed. 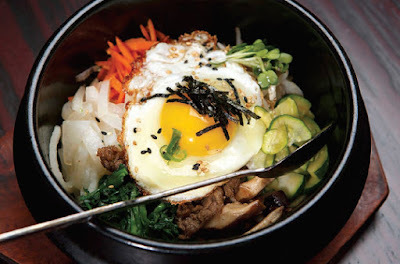 Signature Korean dish bibimbap features rice, vegetables and choice of meat with a fried egg. Noodle-centric Japanese udon soup is available in seafood, kimchi and tempura varieties. Service at Oiso is friendly and efficient, although during busier times the staff can get overwhelmed. This is a great place for a business lunch or date night.